Stockport Council are pleased to announce that they have been shortlisted as a North West finalist for this year’s National Apprenticeship Awards 2018. Representatives from the Council will be attending the North West Regional Apprenticeship Awards Ceremony at Manchester’s Marriot Victoria and Albert Hotel on the 19th September, where they will be hoping to take home the Regional Macro Employer of the year award for the second time. 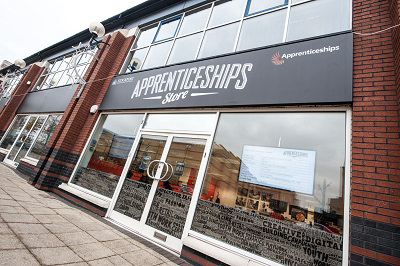 This nomination recognises Stockport Council’s dedication to apprenticeships, including the flagship Apprenticeships Store, a number of trailblazing degree apprenticeships and the Supported Apprenticeship Service for disadvantaged young people. Councillor Dean Fitzpatrick, Cabinet Member for Education, expressed his pride in this nomination, saying: “Apprenticeships offer a great option to train, upskill and increase confidence in both new and existing staff. I am proud of Stockport’s key role in embracing and developing apprenticeship opportunities and the impact this has had on our local economy and communities”. For more information about apprenticeships, visit the Apprenticeships Store on Stockport Exchange, SK1 3TA, email apprenticeships@stockport.gov.uk or call 0161 474 4745.